Very few exhibitions can genuinely be regarded as landmarks, having instant and profound effects on perceptions. One of these was Film und Foto, the ambitious international survey first staged, in 1929, in Stuttgart, Germany, to showcase all that was new and transformative about photography and cinema. 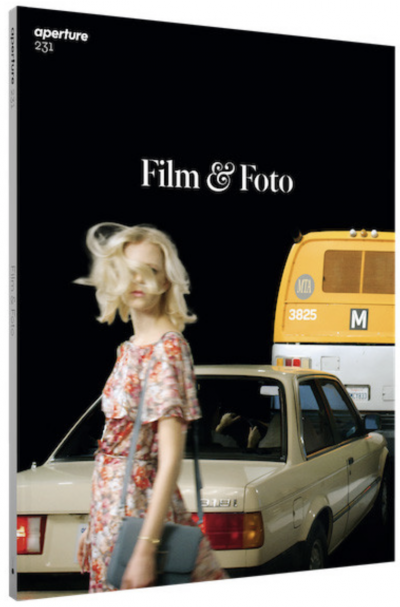 FiFo (as it was known at the time) put aside anxieties about the status of photography as Art, capital A, to look instead at its comprehensive redefinition of modern vision and its diverse roles in society. Photography had become central to science, architecture, fashion, advertising, reportage, tourism, and more. Yes, it could be framed on walls, but it could also be used in the streets on posters and billboards, in books, journals, and magazines. And, of course, photography was a fundamental ingredient of filmmaking. Arranged over thirteen rooms, the show drew together nearly a thousand images (the exact number is unknown but 940 are listed in the catalogue), nearly all by living photographers from Europe, America, and Japan. There were political photomontages and book jackets by John Heartfield; New Vision photographs by Germaine Krull, Aenne Biermann, Florence Henri, and Albert Renger-Patzsch; the crisp formalism of the Americans Charles Sheeler, Imogen Cunningham, Edward Weston and his son Brett; cameraless abstract images by Man Ray; photo-text graphics by Piet Zwart, El Lissitzky, and Karel Teige; fashion shots (including Edward Steichen’s images for Vogue); plus anonymous industrial, scientific, sports, and news photographs. FiFo was also accompanied by a film festival that presented the latest experimental cinema with works by René Clair and Sergei Eisenstein. Some practitioners, including László Moholy-Nagy, showed their photographs and films. Indeed, one of the aims of FiFo was to highlight how central the photographic sensibility was to the development of the avant-garde. Against mainstream cinema, avant-garde film tended toward an anti-narrative poetics: the expressive combination of fragments, resisting the presentation of seamless stories. Still photography forever struggles with narrative, but this predisposes it toward an alliance with avant-garde film. There were immense practical problems in aligning photography and film in the exhibition. One possible solution was montage and sequencing, practices common to both. In the galleries of FiFo, the displays used various kinds of montage, encouraging the mobile audience to move from one image to another and another, accumulating their response to the almost overwhelmingly large exhibition. The tone was set in the opening room, organized by Moholy-Nagy: a densely hung overview of the history of the medium, each image resonating with those around it. But it was the Russian room, designed by Lissitzky, that really took on the challenge of bringing together still and moving images. In the middle of the room stood podium-like constructions into which viewers peered to watch film clips rear projected onto small screens. Elsewhere, strips of photographs were rear projected in the space. There were enlarged printed sequences of frames from films, and sequences shot by still photographers. The thorough exploration of moving images in galleries really only began in the late 1960s with the advent of video art displayed on TV monitors. Video projection became widespread only the early 1990s. Lissitzky’s experiment was way ahead of its time. After Stuttgart, FiFo toured to Zurich, Berlin, Vienna, Danzig (today Gdańsk), Zagreb, and, in 1931, to Tokyo and Osaka where it inspired many young Japanese image makers. While not the most visited exhibition (that was The Family of Man, which toured globally for several years from 1955), FiFo has remained relevant and proven to be most frequently revisited by curators and artists. Several museums have staged subsequent versions, each with a different emphasis. In 1975, it was partially reconstructed by the Württembergischer Kunstverein to set the scene for the survey exhibition Fotografie 1929/1975. Then, in 1979, to mark its fiftieth anniversary, Film und Foto der zwanziger Jahre, presented in Essen, Germany, was a much more substantial reimagining. The reputation of FiFo continued to grow. In 2009, the Staatsgalerie Stuttgart presented Film and Photo: An Hommage. This wasa scholarly appraisal, featuring posters and publicity for the 1929 show,alongside over seventy photographsby several of the original participants, including Berenice Abbott, Hannah Höch, and Paul Outerbridge. Also, in 2008, a restaging of the by now legendary Soviet room was a highlight of Universal Archive: The Condition of the Document and the Modern Photographic Utopia, curated by Jorge Ribalta for Museu d’Art Contemporani de Barcelona(MACBA). This exhibition aimed to show how photography had been mobilized across the middle decades of the twentieth century in the name of modern collective consciousness, either as propaganda or as resistance to it. FiFo’s somewhat naive faith in the medium to liberate a new modern spirit does now seem propagandist, despite its inclusion of anti-Fascist and antitotalitarian works. In 2013, the Los Angeles County Museum of Art presented a room dedicated to FiFowithin its exhibition Hans Richter: Encounters. Richter, an experimental filmmaker, had been the curator of FiFo’s original film program. The room evoked the spirit of the 1929 show by bringing together photographs with various projections and computer screens presenting excerpts of films from the 1929 roster. While FiFowas a silent project, its presentation in1929 occurred when the arrival of sound in cinema—the talkies—was taking place. In the silent era, films and film actors had become truly international in their appeal and reach. Charlie Chaplin, Buster Keaton, and Greta Garbo had more worldwide recognition than even today’s supposedly global superstars.But sound meant speaking voices, and no longer could a wordless, gesturing actor appeal across language barriers, and across the still and moving image. While still photography pressed its mute and static claim to be the visual currency of a borderless world, the arrival of sound led to the rise of emphatically national and regional movie cultures, which still exist to this day (despite the tacit promotion of English as a world language). Sound also seemed to take cinema away from its immediate affinity with still photography. The early written histories of photography regularly included cinematography, but this did not last. The guardians of photography soon wanted to focus on the distinctiveness of their medium, while cinephiles sought to develop a separate history for film. And yet, as media converge ever more, and digital technologies scramble all distinctions between stillness and movement, FiFo continues to exert its fascination. I made my notes for this essay on a smartphone, while traveling. I have been reflecting regularly on questions of stillness, movement, silence, and sound in the images I shoot and upload to Instagram. What would those pioneers of the 1920s make of this? I suspect most of them would have leapt at such technology, leaving celluloid and the photographic darkroom for dust. So much of what they were hoping for, striving for, is there in the palm of your hand. And then I remind myself of an extraordinary camera launched in France around1920. The Sept had seven functions. As well as shooting stills, short sequences, and movies, with the addition of a lamp housing it converted to a contact printer, an optical printer for filmstrips, a projector, and an enlarger. All in one! Cameras do not invent themselves. There must have been a desirefor such a thing, nearly a century ago. A desire to close that gap between photography and cinema. A desire to fold all imaging practices into one. In 1925, the Russian multimedia artist Alexander Rodchenko visited France from Moscow to witness firsthand the energy of modern Paris. While there, he bought two Sept cameras, the second for his friend the filmmaker Dziga Vertov. It is not known if Vertov used his to any extent, but Rodchenko shot sequences of market traders with his. Staring at the scant and grainy installation shots that survive from FiFo, I can see several vertical sequences mounted on the walls of the Soviet room. I would like to think some of them are shot with that camera, which anticipated the technologies of vision we now take for granted.